Max King Holding Company LLC, through its subsidiary Max King Realty V LLC, announced today that it purchased 18.49 acres of industrial property at 6413 and 7001 McCoy Road directly facing the 528 “Beachline” Expressway for a cash purchase of $1.1 million. 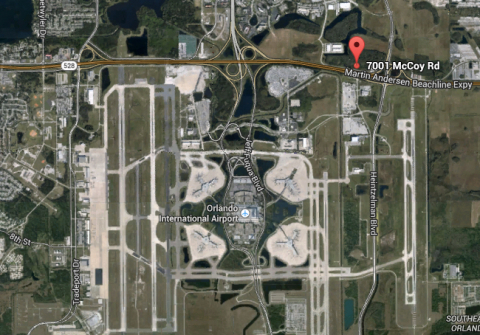 The property is located near the Lee Vista Industrial Park, less than half a mile from the Orlando International Airport. Airport Acres Property on McCoy Road. The land will be developed with 30 and 25 foot clear height industrial warehouses and manufacturing facilities to suit the needs of existing Max King Realty clients and new clients desiring efficient and modern facilities with easy access to the Airport. The new facilities will be constructed with 100% concrete tilt wall construction. The buildings will also employ the latest in both energy efficient lighting and security technology including LED lighting, biometric locks and internet broadcast video cameras. A total of four buildings providing 115,000 square feet of sub-dividable space is planned for this parcel. Marjorie Johnson of Cushman & Wakefield represented the seller Airport Acres Limited Partnership a subsidiary Euro American Partners.